The Juice Diet has been around since the early 90s, when a man named Peter Glickman, an entrepreneur and a scientologist, came out with a diet called The Master Cleanse which consisted of lemon juice, maple syrup, and cayenne pepper. It required you to intake this and only this for 10 days. 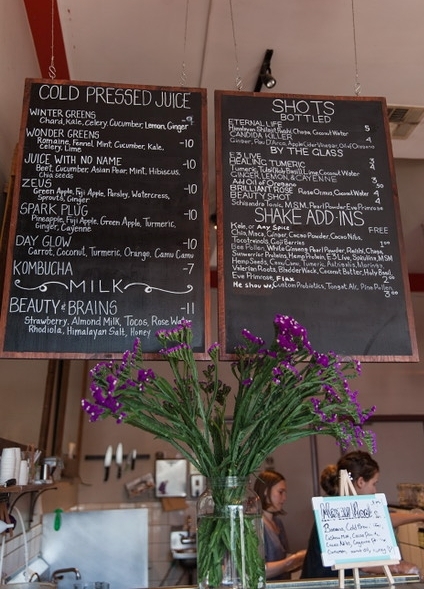 Nowadays, it seems everywhere you turn, there is a new juice bar popping up on every corner and in every neighborhood. I love juice just as much as the next person but how healthy are these so called "Juice Diets" and do they actually work? I recently visited a fabulous juice bar in Los Feliz (a suburb located in East Los Angeles) called Punchbowl, which is famous for it's juices and protein shakes, and I was determined to find some solutions. Let's just say some of my findings will throw you a mean punch! WONDERING: JUICE DIETS...Healthy Cleanse or Dumb Detox? GO GREEN OR GO HOME- If you love juice without the calories, it is best to go for the green juices only. Those that feature Kale, Cucumber, Celery, Spinach. Many of the juices out there on the market are high in concentrate with FRUIT. (This is a No-No) Fruit has a ton of added sugar (good sugar) but not if you're trying to shed the pounds. PROTEIN PLEASE!- When you cleanse strictly on juice, your body is forgoing the protein it needs to keep the wheels turnin, not to mention the fiber that gets missed. It's so important to add protein to your juice (powdered amino acids or hydrolyzed collagen will do the trick). KEEP THE FAT!- Go ahead and add fats to your juice for long lasting energy! (Chia seeds are the best for this. They provide the body with Omega-3 fatty acids-that's just one ounce serving!) They also help with improving mental clarity and maintaining focus. With all of this being said, I would have to say that Punchbowl offers a fantastic variety of greens and proteins to add to your juice or shake. It's one of the best juice bars in the city and it offers some interesting concoctions including my personal favorite, "The Cinnamon Blossom" which has Bananas, Cashew Milk,Dates, Cinnamon, Vanilla, and Orange Blossom. WonderFact: All of their juices and shakes are 100% organic!